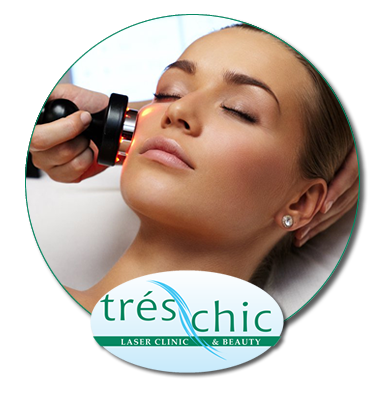 Trés Chic is a renowned Laser, Skin Care and Well Being Clinic in the heart of Gorey, Co. Wexford. Established in 1998, it is the longest running Clinic in Gorey, so you can be confident in the knowledge and experience of our specialist staff. Over the years Deborah and her team have offered a wide range of services and products to help improve and correct any skin concerns you may have. We treat Unwanted Hair, Pigmentation, Broken Veins, Birthmarks, Acne, Rosacea, Skin Tag Removal, Milia Removal, Scar Reduction and prevention, Reduction of fine lines and wrinkles, UV Free alternative for Psoriasis, Eczema and Dermatitis, Seasonal Affective Disorder (SAD). We believe in treating the whole body from an holistic approach. We are proud to offer Colon Hydrotherapy and nutritional advice alongside our treatments. At Très Chic our clinical facials begin with a skin analysis using our Skin Analyser Machine. This enables Your skincare consultant to see your skin in a whole different light. By illuminating the face in a special light will reveal what the naked eye can’t detect: fine lines, clogged pores, sun damage, dehydration, sensitivity and more. The esthetician determines your skin type, any skin conditions that may affect the care of your skin and what medical grade skin care products should be used to treat your skin type. The Skin Analyser Machine uses a fluorescent black light with a magnifying mirror for analyzing the skin.